It's the Lenten Pretzel Bake Off of 2009! 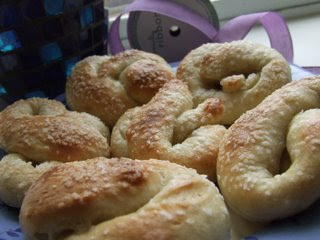 Just like last year I am taking suggestions for homemade pretzel recipes to try with my kids! Please let us know if you have discovered a yummy super easy recipe that your family loves! This truly is a sacrificial act for me because it is soooooo easy to run up to Target after Mass and pay the gangly kid behind the counter a nice, tidy sum to bake, butter and salt to taste perfect pretzels for each of my hungry kiddos. It's not that I am lazy, just afraid. An encounter between me and that temperamental stuff almost always ends badly (the one exception). Karen E., do you have a recipe for pretzels? Ruth's family liked this one and I am intrigued by it since it only calls for a warm water bath for the pretzels prior to baking and not a boiling one. I am not sure who Auntie Anne is but I hear she isn't afraid of yeast! Then again, there are some recipes that don't call for a bath at all. Now, I know that bagels are also boiled before they are baked but not being a kitchen scientist, I don't really know why so if anyone cares to enlighten me, I would be most appreciative. Thanks and have a great weekend! I think that the water bath is what gives them that nice smooth crust. We made these last year. I found them easy and no bath!! I'm kind of liking your idea of buying them though, our Sam's Club makes great ones!! But this recipe really was easy! I haven't made this recipe yet, but I've made lots of other stuff from her site with good results. I was planning on trying a different pretzel recipe each week with my daughter during Lent...I'll let you know the results! Charlotte, yeast can be scary (LOL) but manageable. Making pretzels in Lent is a family tradition over here. Our older three daughters took it over, one handing the how-to down to the next when they were older and on their way out the door and up to the altar. Now our 16yo is completely in charge and won't let me in my own kitchen this year! I have the recipe we use and a few photos on my blog here, very easy I promise you....smile. Oh, I'm so glad I'm not the only person afraid of yeast! I just checked out Artisan Bread in Five Minutes a Day and saw a pretzel recipe in there. I'm hoping that book will help me conquer my bread-making fears.